Zetaro is a Puffigen rabbit an interesting species of bunny native to the mountains the rabbits have long ribbon like ears that extends to 2 times their body length their age is determined by the size of the tail Big and full tails tell that the bunny is an adult while small tails tell the bunny is a child the Dark rings around the eyes denotes the bunny is of the highest ranking and respect and full of the most wisdom. Most of these creature eat Puffigen fruit which actualy make them light weigh and capable of blocking strong impacts as every cell in their body turns into a cushion against it. Zetaro is a loan shark at most times and is rather immature but once you get to know this rabbit he is actually rather sweet. he's a tough guy and very confident in his abilities he has a soft spot for video games and loves playing them whenever the chance a rises. He also has a habit of doing naughty actions and responses to girls he likes. Zetaro sometimes misses his family and will sometimes write to them. 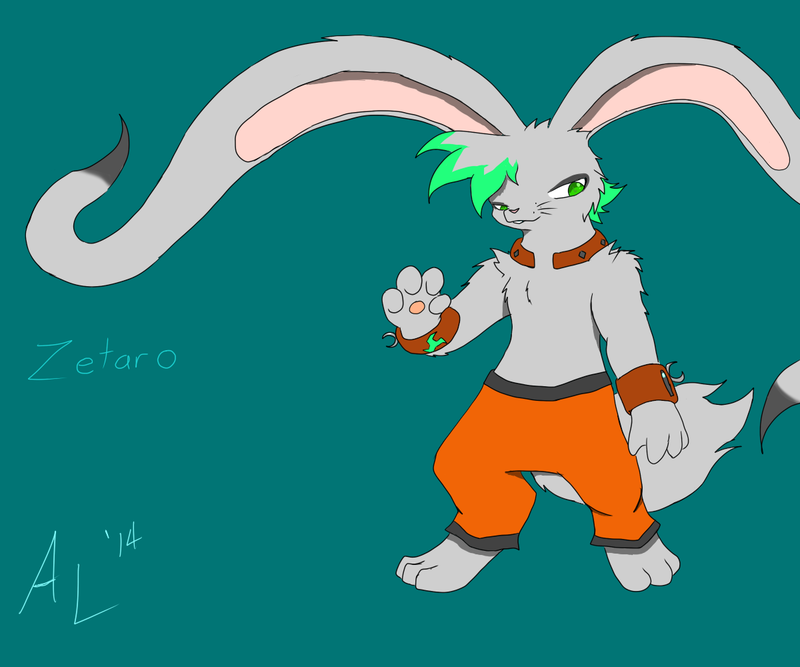 At first appearance Zetaro is a scrawny bunny but in truth he is stronger than he leads on. He is capable of lashing out kicks and punches with gale force impacts by his eyes he is a high ranking Puffigen Rabbit and a Young adult.